FEATURE: Why is the Due Date director so successful? Director Todd Phillips isn't mentioned in the same breath as the modern film comedy maestro, Judd Apatow. Phillips' movies have launched careers and franchises alike. Old School quickly joined Animal House in the pantheon of college comedies, and his 2009 sleeper The Hangover sparked major careers for co-stars Zach Galifianakis, Bradley Cooper and Ed Helm. Not bad, especially considering Phillips doesn't turn 40 until late December and passed on directing one of the biggest comedy smashes of the last decade, Borat. His new film Due Date promises more of the same. He pairs Robert Downey, Jr., an actor with two action franchises to his name, with Galifianakis for a road trip comedy all but guaranteed to sell tickets. 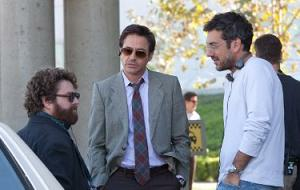 Downey plays an expectant father forced to spend way too much time in a car with an aspiring actor (Galifianakis). Melinda Petrow, spokeswoman for Fandango.com, says Phillips is nothing less than a star maker. "He has this uncanny ability to cast guys who are rising stars and carve out these memorable roles for them that catapult them to the top of the A-List," says Petrow. Phillips may traffic in comedy staples --Due Date is his second road trip film entry--but he squeezes every last drop of humor out of these stock scenarios, she says. His protagonists seek redemption and work under deadlines to fulfill them. "That keeps the audience in suspense and has you laughing at every road block along the way," she says. And no one directs men behaving badly like Phillips. "He can take a group of young, good looking actors and turn them into a lovable posse of naughty boys acting like schoolboys left home alone," she says. "It's the ultimate male wish-fulfillment fantasy come to life, while avoiding the ‘bromance' sentiment you might find in comedies." Justin Bartha, who starred in The Hangover and is currently shooting The Hangover 2 with Phillips, describes the director as "fearless." The actor recalls how Phillips at the dawn of his career turned a student film short into a feature-length documentary called "Hated" on punk rocker GG Allin. Phillips retains the eye of a documentary filmmaker even while making ribald comedies. "He wants something that's real, what's real is funny to him, even in extreme circumstances," he says. "He had a more specific point of view of real comedy and surprise than anyone working in comedy movies," Bartha says. "He knows exactly what he wants, what's in the frame and what's going to be funny."